This Cube Agree C:62 Pro 2017 bike is in great condition. However, it has previously been ridden for a number of miles, and as such there is some wear on the drivetrain and general light wear and tear. Our Agree C:62 Pro sets new standards in the endurance race bike category. It's unsurpassed in its combination of dynamic handling and comfort. 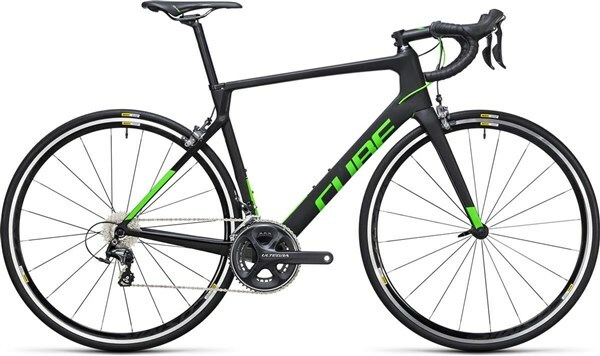 This is a bike that wants to be ridden hard, translating every watt of effort at the pedals into instant forward progress. The Agree C:62 Pro doesn't just look every bit as fast as a pro team rider's bike; it IS just as fast. When we set out to spec it, it was clear that only the best technology would be suit the Agree C:62 Pro. That's why it runs on Mavic's Cosmic Elite wheelset, the 30mm rim profile guaranteeing an aerodynamic advantage. Rider contact points are provided by the Selle Italia X1 saddle and ergonomic Wing Race Bar. Shifting and braking is handled by Shimano's peerless Ultegra groupset. The 2x11 transmission, complete with compact chainset kitted out with 50 and 34 tooth chainrings, means the road will simply disappear beneath your wheels.